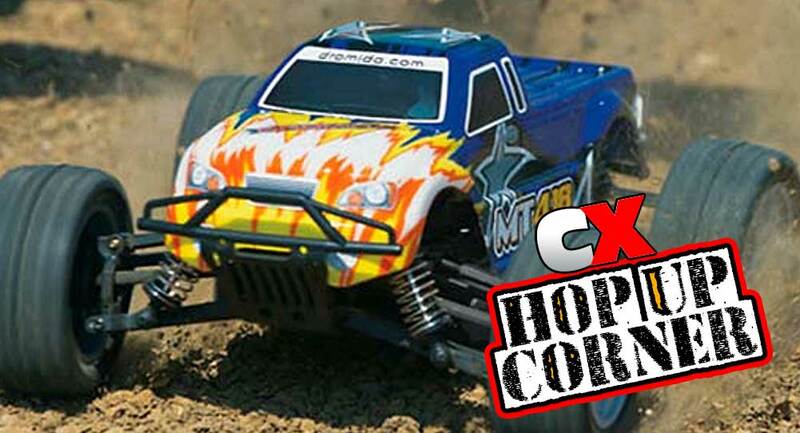 For this installment of Hop Up Corner, we’re going to check out some of the best upgrades for your Dromida MT4.18 RTR Truck . This little guy is great as an entry level vehicle for its size and low cost, while still providing enough room for upgrades. We’re going to make it a little more Monster-Trucky – let’s dig in. The suspension on the Dromida MT4.18 is pretty good for such a small vehicle. The oil-filled shocks soak up alot of the harsh terrain while the tall tires help give it some respectable ground clearance. 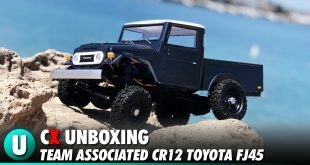 The stock bodies are plastic, which are fine, but if you really want to get offroading in this bite-sized rig you’re going to want to upgrade to aluminum for consistency. 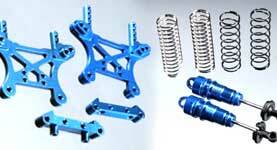 For that, I suggest picking up the Dromida Aluminum Shocks and Shock Tower Upgrade Kit . 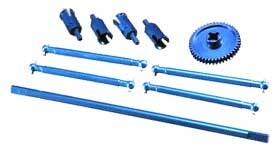 This kit comes with 4 pre-assembled shocks that have threaded bodies to make altering ride height a cinch. 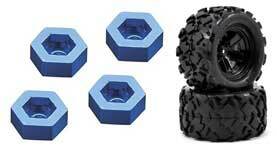 This kit also includes an aluminum front and rear shock tower – more strenght AND more bling! It’s a great kit that is easy to install and comes at a reasonable price. I typically like to upgrade the ESC and motor when I’m dealing with a vehicle that comes with a brushed system, but this isn’t the case with the Dromida MT4.18. They power that this little bugger has out of the box is pretty good, easily enough to have a good time almost anywhere you go. 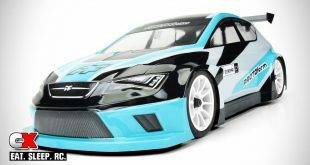 Upgrading to an uber-powerful brushless system then makes the vehicle much harder to drive, taking alot of the fun out of why you got it in the first place. 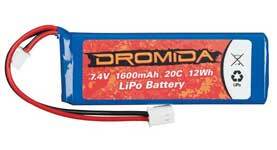 So, my suggestion is to simply upgrade the battery to a LiPo pack like this one: Dromida 1600mAh 2S 7.4V LiPo Battery . This pack is a major upgrade from the included 6-cell NiMh and you will see a pretty big boost in power and longer run times. The best part is, your MT4.18 will still be driveable! 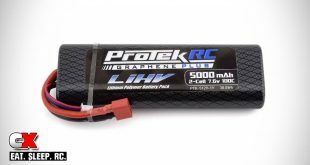 Note, however, you might have to pick up a LiPo-compatible battery if you don’t have one already, but once you go LiPo, you won’t ever go back. One of the weak points in the Dromida series of cars is the spur gear. It’s made out of plastic and, if you’re a serious offroader, it can get all goobered up with rocks and debris. This usually results in a failure right as the fun times are starting to roll. My drivetrain suggestion is the Dromida 4.18 Aluminum Upgrade Kit . It comes with aluminum outdrives, dogbones, a center drive shaft and, best of all, an aluminum spur gear! Installation is pretty simple and is a great investment for under $25. I had to dig pretty deep for something I felt would set the MT4.18 off. The stock body is cool, but it doesn’t scream ‘Monster Truck’ to me. So, when I asked my wife what she thought of when I said Monster Truck, her first thought was Grave Digger. Thanks to Parma, we can actually turn this MT in a micro version of that very truck! 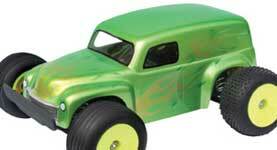 Check out the Parma 50’s Panel Truck Body , a clear shell that is an open canvas for whatever paint scheme you want, including Grave Digger. You’ll need to pick up some additional body mounts (or if you’re handy, fabricate something), but to be able to roll around with glowing red eyes is well worth it. Bonus – it’ll only set you back around $15. You can’t beat that! Finding an optional set of wheels and tires for this truck proved to be a little difficult, until I came across a set of Dromida Aluminum 12mm Wheel Adapters ! These adapters open up quite a few options for aftermarket options, one of them being the Traxxas Teton Wheels and Traxxas Teton Tires . This combo looks great and is just about the same size as the stock wheels and tires, so you won’t feel any ill effects from installing them. 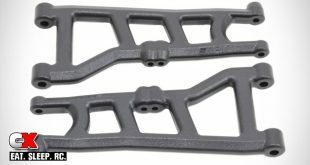 They have excellent traction and come in pairs (both mounted and un-mounted). Best of all, they add a nice custom look to your MT4.18. Accessories for the Dromida MT4.18 were also quite scarce – perhaps a charger or radio upgrade – but then I found this little guy that would take your MT4.18 to the next level. 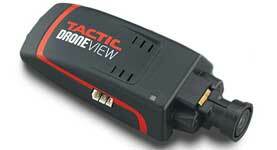 The Dromida Wi-Fi FPV HD Ominus Camera unit uses a small, HD camera to capture video and display it on a screen. Wait, you have to have a screen? Well, yes, but most likely you already have one – your smartphone. Using a downloaded DroneView app, you can see where your MT4.18 is headed via the Wi-Fi connection. A 4GB micro memory card is also included to record your driving if you don’t want to drive FPV (First Person View). I’ve actually used a similar FPV system on a slighly larger vehicle and it’s quite fun! So there you go; an upgraded Grave Digger meets FPV conversion that is sure to bring some life back into your Dromida MT4.18!